Burlington Labor News [[italics]]Official Organ of the Burlington Trades and Labor Assembly[[end italics]] VOL. XXXIX. No. 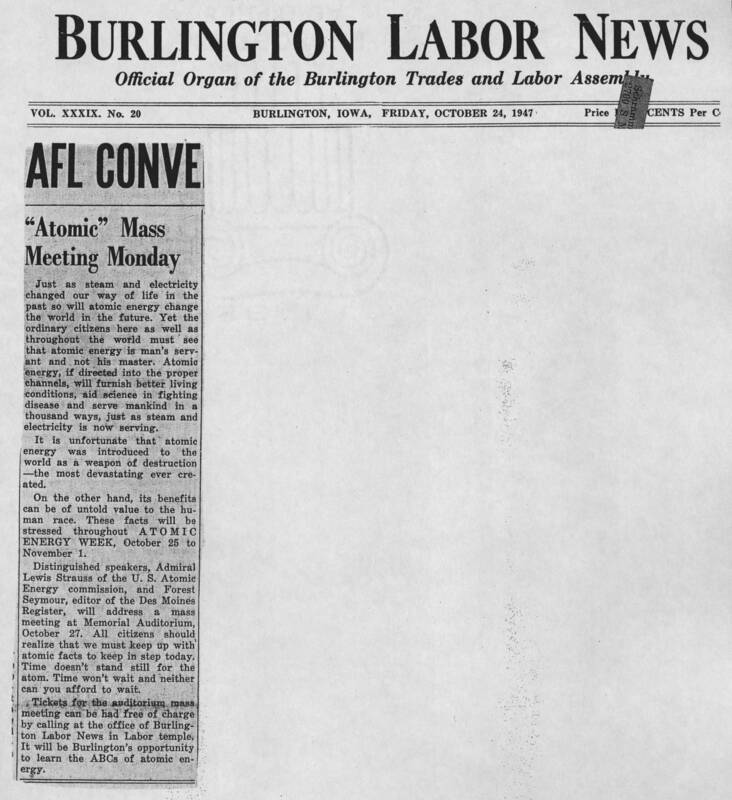 29 BURLINGTON, IOWA, FRIDAY, OCTOBER 24, 1947 AFL CONVE "Atomic" Mass Meeting Monday Just as steam and electricity changed our way of life in the past so will atomic energy change the world in the future. Yet the ordinary citizens here as well as throughout the world must see that atomic energy is man's servant and not his master. Atomic energy, if directed into the proper channels, will furnish better living conditions, aid science in fighting disease and serve mankind in a thousand ways, just as steam and electricity is now serving. It is unfortunate that atomic energy was introduced to the world as a weapon of destruction--the most devastating ever created. On the other hand, its benefits can be of untold value to the human race. These facts will be stressed throughout ATOMIC ENERGY WEEK, October 25 to November 1. distinguished speakers, Admiral Lewis Strauss of the U.S. Atomic Energy commission, and Forest Seymour, editor of the Des Moines Register, will address a mass meeting at Memorial Auditorium, October 27. All citizens should realize that we must keep up with atomic facts to keep in step today. Time doesn't stand still for the atom. Time won't wait and neither can you afford to wait. Tickets for the auditorium mass meeting can be had free of charge by calling at the office of Burlington Labor News in Labor temple. It will be Burlington's opportunity to learn the ABCs of atomic energy.